Utilise cloud computing in business for cost effective online backups, outsourced servers and full scalability, no matter the size of your company. Cloud based services are already all around us. 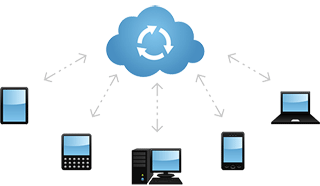 We can already access files, music, photos via the Internet with relative ease using all manner of connected devices but when it comes to business, cloud computing begins to get very interesting. Google is a great example of cloud based computing, allowing you to create and store work via products like Google Docs and Google Calendars. Microsoft’s Office 365 offers cloud computing solutions allowing groups to create and share data such as contacts, files, calendars, meetings and be able to access this from any Internet connected device. To the cloud or not to the cloud? That is the question. To help you understand how cloud computing could benefit your business why not get in touch? We have a wealth of knowledge on planning, building and supporting cloud based solutions and can offer a full turnkey service. Hosted Desktop – work where you want, not where your desk is. Hosted Email Services – take control of your business emails with a fully managed cloud based solution.